How’s this for a list of ingredients for a very special recipe? Two mates, one batty old lady, a grumpy cat, a vicar, two absent parents, a mysterious jewel, and a teacher liable to bare his teeth at the rise of the full moon. These are the things that set Miles Salter‘s Howl alight. No, this is not the Allen Ginsberg poem, but thankfully rather lighter but equally vivid fare. Set around the town of Rigor Mourtice and its primary school, Howl focuses on James Small and his mate Neville Heavy. A new teacher, Mr Grindell, has joined the school, and seems determined to make their lives a misery. Then James’ parents have to go away, and (I wasn’t quite sure how believable this was – but it works for the plot, so never mind), he’s sent to spend two weeks living with a childminder he’s never met before. But Mrs Winters isn’t just a stranger; she’s truly bonkers. She’s also concerned with Mr Grindell’s peculiar behaviour, especially where it regards the local church and a long lost treasure. The tale crackles with energy, helped along by the two boys and their mischief, courage and determination. The two friends are brilliantly matched, and their characters utterly believable. Mrs Winter’s eccentricity is a joy, while Mr Grindell is wonderfully sinister even when he isn’t doling out peculiar punishments such as making the lads stand in the school’s ankle-deep and icy cold pond. All other adults are incidental, as seems only right in a book aimed at 7 to 10 year olds. I enjoyed the filmic quality of Salter’s writing, with his descriptions providing a vivid backdrop to the action as the story speeds towards its crescendo. 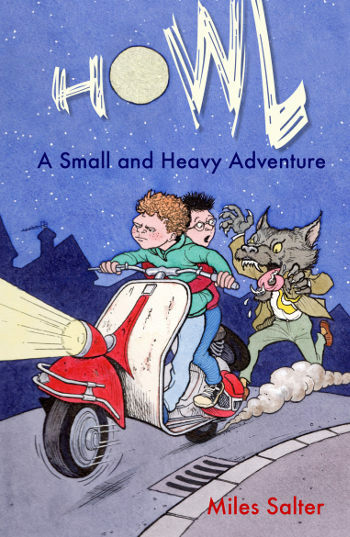 Howl: A Small and Heavy Adventure by Miles Salter is published by Caboodle Books Ltd and available to buy from Amazon. I’m always happy to find out what you’re reading. To submit or suggest a book review, please send an email to Judy(at)socketcreative.com.